Arthritis comes on in many ways, but the most common cause is the wear and tear the joints undergo over the years: they simply wear out. 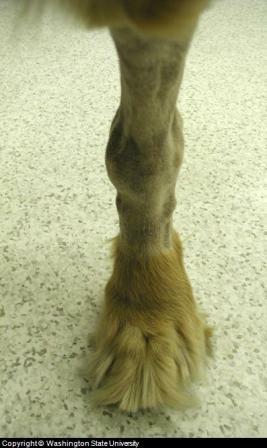 Veterinarians sometimes refer to it as Arthritis, Osteoarthritis (OA) or Degenerative Joint Disease (DJD). Arthritis is the most common health problem in senior dogs. So if you own a dog, chances are that you will have to deal with this issue at some stage. The key to detecting any issues early is to take advantage of the health and wellness checks offered by your vet, some even provide a dedicated Senior Pet program. Nature’s solution to motion are biological hinges – two slick, smooth surfaces coating the bones that form each joint. 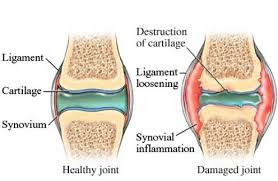 The ends of the bones that form all movable joints are formed of a cushiony layer of cartilage that is coated by a slick slippery membrane called the synovium. To reduce friction, the space in between is filled with an oily fluid; and the whole structure is bound together with a series of fibrous tissue and ligaments. The secret to the long-term success of this wonderful apparatus is that its components are all living and capable of repair. But as dogs age, this repair process becomes less and less successful and makes errors. With years of repeated movement, several things begin to happen. The fibrous elastic sheets (fascia) and the ligaments begin to stretch, allowing the bones that form the joint to rattle slightly as they move. This in turn bruises and erodes the joints surfaces causing inflammation. And as these surfaces continue to move, the inflammation causes new bone to be laid down where it does not belong, causing pain, and bone to be reabsorbed from where it is critically needed. This is called remodelling and it is a vicious painful cycle. Taken all together, this is what arthritis is. The problems that lead to arthritis begin early in your pet’s life. But because joints are tough and reparative, you probably will not notice pain or lameness in your pet during its younger years. When a particular joint is damaged through accident, or born misaligned, it may not be able to repair itself. If your dog was born with abnormally shaped bones or abnormally lax joints (Dysplasia) arthritis may appear in its youth. Large and giant breeds that are prone to Dysplasia include German Shepherds, Golden Retrievers, Great Danes, Labrador Retrievers, Rottweilers, Saint Bernards etc. and they tend to develop arthritis sooner. It also runs in families or lines of dogs so if the parents of your pet did not develop arthritis until a ripe old age, your pet probably won’t either, therefore it is essential to buy your puppy from a reputable registered breeder. 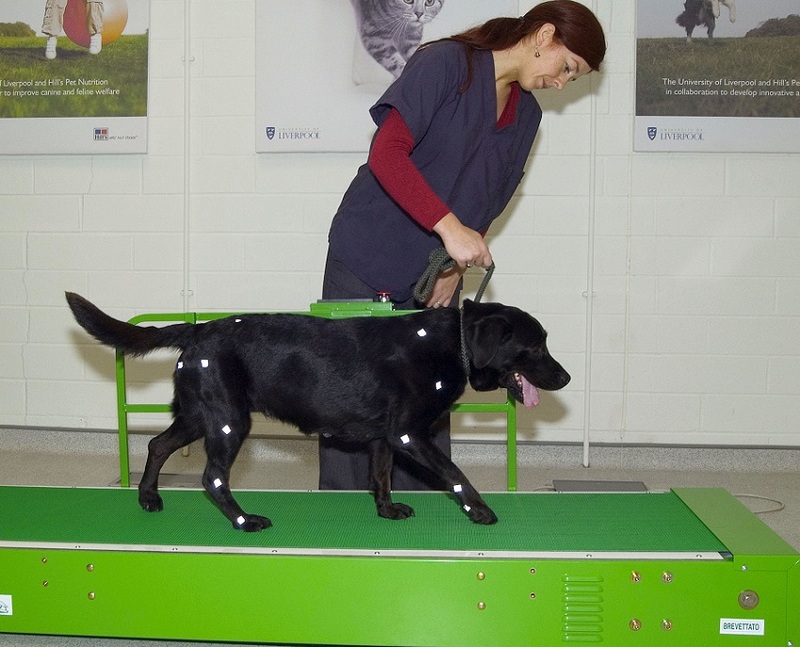 Very active dogs - working dogs or those competing in sports like agility, flyball or canine disc - can easily wear out a joint by the time they're middle aged and an injured and untreated joint can quickly develop arthritis. 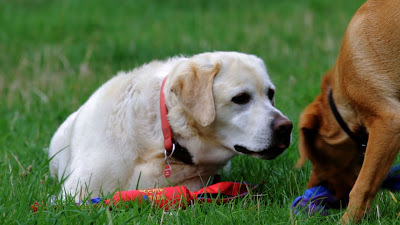 The telltale sign of arthritis in older dogs is a reluctance to move about. As your dog’s joints age, he will become more reluctant to run or play for long periods. He won’t be bouncing up and down the stairs and you may notice he is stiff or even limping when he rises in the morning? These changes almost always come on very gradually so it is easy to ignore or not notice signs at first. Larger dogs were bred to be very pain-resistant and stoic so they won’t let you know that they are in pain until their arthritis problem is quite advanced. 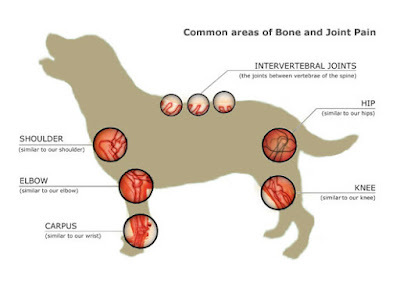 As dogs guard their sore joints, the muscles and ligaments contract, decreasing the joint’s range of motion. 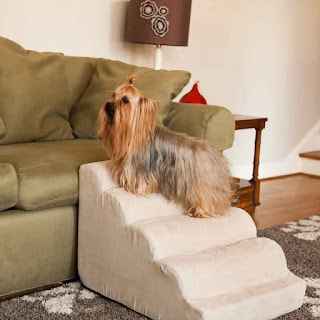 You may notice that your pet no longer jumps up on sofas and chairs as it once did? One common symptom of age-related arthritis is that joints tend to be stiffer and more painful after periods of rest and that pain tends to work itself out during the day. By evening, your pet may be its old self again. The major muscle masses of your pet’s legs and spine may have shrunk (atrophied) due to disuse and your dog may wince when areas of its spine are palpated. But the key tests your veterinarian will perform are x-rays. Depending on how subtle the changes are, it may take more than a single x-ray film. X-rays of advanced arthritic joints are very distinctive.Most veterinarians will set these x-rays up in the exam room and point out to you the important bone changes that they are seeing. Most of the modern pain relieving arthritis medications are also anti inflammatory: these are the so-called Non Steroidal Anti-inflammatory Drugs "NSAIDs". They reduce the inflammation in the joint and surrounding tissues and the dog is able to use the limb more freely. These can be given as an injection, followed by tablets. There are also some newer tablets that are given once a month, which provide a continuous low level of anti inflammatory relief, aimed at preventing the pain and inflammation before it starts, rather than requiring higher doses to "put out the fire". Tempting as it might be, do not give your pet any human painkillers. Many dogs and cats have wound up in emergency treatment for toxicity after swallowing human medications. Some dogs may not be able to have NSAIDs, especially if there are concerns about their liver and kidney function, both of which can decline in older dogs. 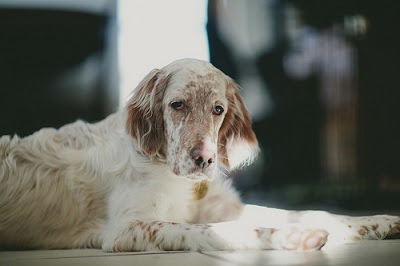 The liver and the kidneys can both be affected by NSAIDs, though most older dogs can be treated safely, especially if regular blood tests are performed to assess the functioning of these organs. If NSAIDs cannot be used, other types of painkiller can be prescribed by your vet. 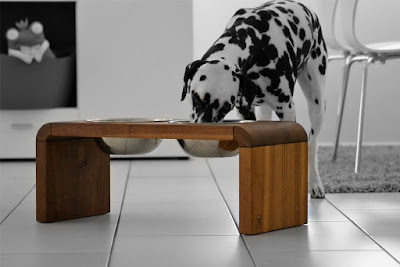 Senior pets are often more comfortable eating and drinking from elevated containers. Thankfully, there are now practical and stylish options to choose from. 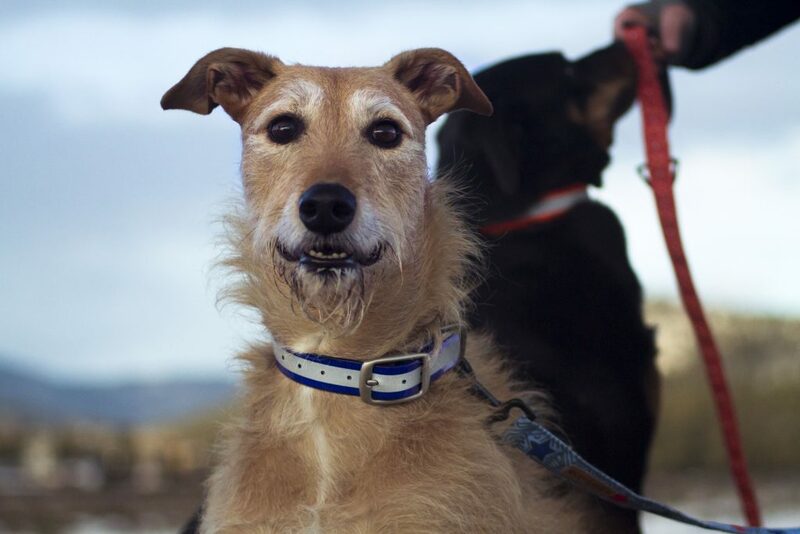 Older, large breeds are also more susceptible to canine bloat (GDV) so feeding your elderly pet multiple smaller meals each day, rather than one or two large ones can assist. Wood ramps, covered with carpet are a real help for pets that can no longer climb stairs or jump onto your bed. Just be sure they are stable and choose a slope as gentle as possible. Keep one (that hooks securely) also in your car to help your pet get in and out. If your pet is no longer able to get about easily, there also are slings, carts etc. that you can purchase to return some of its mobility. 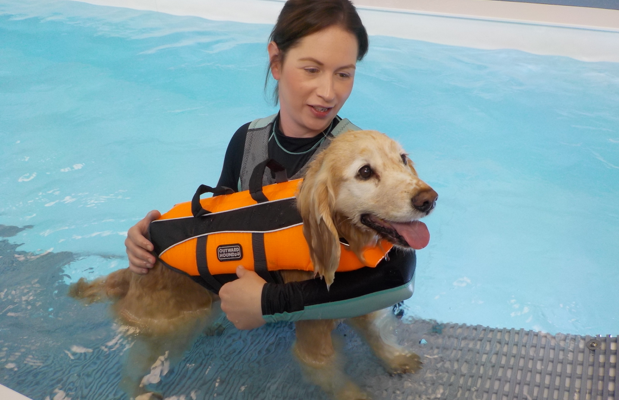 Some online stores specialise in meeting the needs of disabled pets.